I've never worked as a temp, but it is my understanding that temping involves a considerable level of flexibility, and one never knows exactly what job one will be performing or for what period of time. Likewise, Solenostemon scutellarioides1 never know what they're going to be asked to do when they go to a new place. Depending on the situation, their job could be to trail in a hanging basket or as a ground cover, grow as a standard with a straight stem and a ball of shaped foliage at the top, fill in a small bare spot behind a more important plant, or serve as the focal point in a group planting. And coleus is capable of doing all of these things, and more (they even do bonsai! though not very well!2): the leaves are variable in size (1 to 8 in / 2.5-20 cm long), shape (most are more or less diamond-shaped, with slightly scalloped edges; some have narrower leaves with fingerlike lobes), mature height (up to at least 2.5 feet / 0.76 m), habit (trailing or upright), pattern (randomly spotted, outlined in a contrasting color, reticulated) and color (dark purple, burgundy, red, pink, orange, gold, yellow, chartreuse, green). 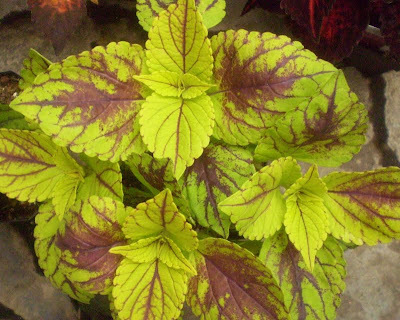 Whatever you want a coleus to look like and do, a capable variety probably exists. 'Glennis.' I don't know if it's particularly easy to overwinter, but I'll be damned if I'm not going to try. Just look at that. Of course, finding that cultivar is another matter: there are hundreds of named varieties, and no registry or authority for them, like with some plants. But even so, if you look at a couple different garden centers in the spring, you'll probably find a variety that will work for what you want. The garden center where I worked had at least fifteen in 2009,3 and we weren't even that big. 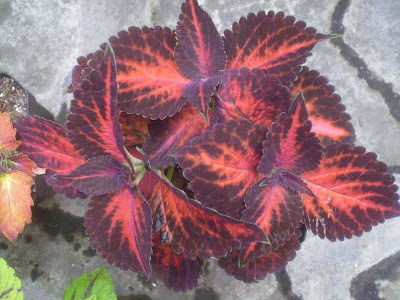 However, coleus are not what you'd call long-term plants. In warm climates they can be kept over as perennials (basically just USDA zone 114), or so I'm told, but for most of us, you can't plant one outside and expect to see it again the following year: the first frost will kill the plant's extremities, and anything much colder than a frost will kill the entire plant outright. This means that most people either abandon their plants to the elements, or they dig plants up and bring them in. Sometimes people don't bother to plant them in the ground at all, instead leaving them in containers which can be brought in at the end of a season. A NOID I photographed at Pierson's in Cedar Rapids. This had been growing for most of the season, and was in a pretty huge pot. Very nice-looking size and shape, though whatever variety this was doesn't do a lot for me. It's been my personal experience that they make pretty unsatisfying houseplants. I have managed to keep one alive indoors for more than a year, so it's possible, but if you want a big, full, bushy plant indoors like you see outside in late summer, you should . . . probably either invest in some serious fluorescent lighting or downgrade your expectations. If, on the other hand, you just want something to stay alive so you can take cuttings and plant those outside in the spring, instead of buying the same plant over and over, you can probably manage that easily enough. 'Quarterback,' the one variety I have successfully overwintered (though it didn't look much like this at the end of the overwintering). Although Solenostemon scutellarioides looks like a regular botanical name, we suspect that no such plant exists in the wild: it is likely a product of human cultivation and hybridization among various Solenostemon species. This is not a particularly unusual situation for a plant to find itself in: a surprising number of houseplants (and garden plants, for that matter) are also hybrids and owe their existence to human intervention and hybridization.5 But this does complicate discussions of coleus's name and origin a little, because we simply don't know where it came from. The original specimens appear to have been collected from Java in the mid-nineteenth century, though these may already have been (natural) hybrids. Not knowing the precise origins hasn't proven to be an impediment to developing new varieties, and an awful lot of people very likely do not care about the details and would be hostile if you tried to tell them about the details, so this is likely to remain a mystery for the foreseeable future. Individual cultivars also often have sketchy pasts: though the story behind some varieties is easily found and a matter of public record, others are mysterious, and more than a few are just the same plant going by a number of aliases because somebody wanted to pretend they had something unique and cool to sell. 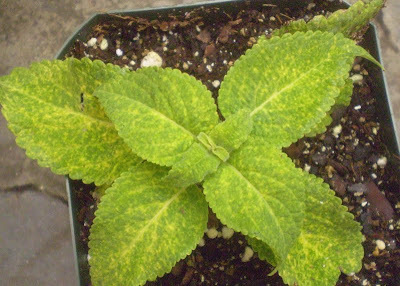 This happens a lot, unfortunately, not just with coleus, though it does seem to be especially bad with coleus. 'Pink Chaos.' I actively disliked this one both years I sold it, but it did sell. Lots. 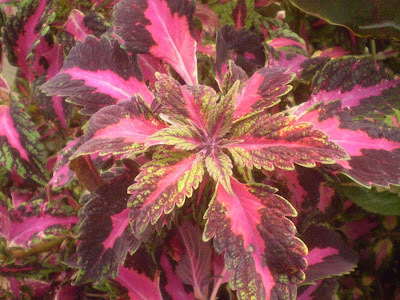 Much, much more has been written about coleus than I could possibly fit into a single blog post. Fortunately, Ray Rogers has written a book, Coleus: Rainbow Foliage for Containers and Gardens (link goes to Amazon; you can also buy it directly from the publisher, Timber Press, if you want to pay an extra $8, which is, um, . . . let's call it counterintuitive), which must surely be the definitive book on coleus history and varieties. (If the book is not definitive, it's not for lack of trying.) Interested readers should definitely track down a copy: the photographs by Richard Hartlage are great eye candy, a good number of varieties are very specifically identified and clearly photographed, along with notes on their quirks (which ones tend to sport, which are quicker to flower and die, etc. ), and frequently also specific information about their origins: who found them, what variety they sported or seeded from, what other names they're sold under, and sometimes even a specific year of introduction. So go there if you're looking for something in-depth. 'Kingswood Torch,' as it usually appears. Oh! Before I forget: Rogers didn't explain it exactly, but he did address the existence of the occasional plant like my 'Kingswood Torch,' which was producing leaves in groups of three, instead of in pairs as is typical. This is apparently just something that happens from time to time with seed-grown plants. Presumably it persists even if the plant is pinched back, since Rogers says that plants that start this way grow fuller than other plants. He doesn't say whether it propagates true from cuttings, but my guess is that it doesn't, since if it did I'd expect to see them patented and for sale under their own variety names. 'Kingswood Torch,' with three-fold symmetry. I would try taking cuttings from my own to find out, but when I read this in Rogers' book and realized that I did not, in fact, have a rare and potentially lucrative new sport, I threw mine away. It was ugly (tall and unbranched, with no leaves at the bottom because I'd let it dry out too often), and I was tired of looking at it, and I'm not sorry. So there. Plants may also change appearance temporarily, according to their growing conditions. Leaf colors, sizes, shapes and patterns are sometimes altered when plants are getting too much or too little light, are too hot, or are over- or underfertilized. Correcting the problem will bring new growth back to normal, though old growth may or may not return to its ordinary appearance. In any case. Indoor culture can be problematic, though it appears that the degree of difficulty depends on the cultivar, with some plants overwintering far more easily than others. So your results may vary, to a greater degree than usual. 'Merlot.' This photo doesn't really do it justice: it can be a very pretty (if monochromatic) plant. LIGHT: Outdoors, most Solenostemons do best in shade or partial sun, though there are some cultivars which are supposed to be able to handle full sun. I haven't tried this personally, though the word at work was that even the "full sun" coleus we had were happiest if not forced to spend the entire day in the sun. As a general rule, Rogers says, darker varieties tolerate full sun better, though there are exceptions on both sides. 'Dappled Apple.' I was never terribly fond of this one, either. WATERING: During summer outdoors, and in warm spots indoors, you will likely have to water established plants fairly often. Also, plants in small pots (for the size of the plant) are prone to drying out very quickly. In the greenhouse, plants that were plugs in 4-inch pots in March were usually so potbound by July that we had to water them twice a day. It's also a good idea to water before you see wilting: although repeated wilting and then reviving won't kill them, coleus respond to underwatering by dropping their lower leaves, and you really don't want them dropping their lower leaves. On the other hand, plants which are being grown indoors, or plants outdoors in cool conditions, can rot if they are too wet, and new seedlings and cuttings are especially prone to rot. So in cool conditions, and especially when overwintering in a cool room, be careful not to overdo the water. You might even want to wait until you see a little wilting, just to be sure. TEMPERATURE: For best growth, temperatures should be between 55 and 95 F (13 to 35 C). Outside of that range, growth more or less stops, and hot temperatures can also change leaf appearance. Outside, there's not much you can do about that, and if it's 95F/35C indoors then you have bigger problems to worry about than your coleus, but it's still something to be aware of. Temperatures colder than 55F/13C will not necessarily kill a plant outright, but growth will stop, and plants become more susceptible to root rot the colder you go. Rogers suggests 50F/10C as the minimum acceptable temperature for overwintering, and says 65-70F (18-21C) is more or less ideal. Below freezing, plants will die. Don't plant them outdoors in spring until you're certain it's not going to frost. 'Wizard Sunset Sun.' I originally questioned whether this was the actual name for the plant, because 1) "Wizard Sunset Sun" is a dumb name for anything, and 2) I was unable to find anything on-line by that name. But I was subsequently informed by Mae in comments that no, this is the actual name. Confusingly, there is also a 'Wizard Sunset,' which is a different color. HUMIDITY: As usual with plants indoors, more humidity is better. I'm not sure how critical high humidity is for success, but coleus transpire8 a lot, and they'll lose water a lot faster to dry air than they will to humid air. Humidity is particularly a big deal for cuttings. Rogers advises pebble trays but says that misting or enclosing the plants in plastic (like a mini-greenhouse, for example) are bad ideas, which will lead to "leaf diseases" (presumably fungus). I'm not personally very impressed with pebble trays, but I'm not about to argue about coleus with the guy who wrote the definitive coleus book. Outdoors, of course, there's only so much one can (or should) do about humidity. PESTS: I'm told that they tried overwintering coleus one year at my former job, only to lose them all to some kind of raging mealybug or spider mite infestation (I don't remember which it was, in the story.). Most of the websites mention whitefly, too, as being especially fond of coleus. Karen715 at Life Among the Leaves has recently mentioned mealybugs. The worst I've experienced personally was a minor spider mite thing at work, which was over almost as soon as we noticed it and didn't result in any lost plants. 'Merlins Magic.' Another one I didn't like, but WCW and some of my other co-workers liked it. Perhaps it gets better as it ages. 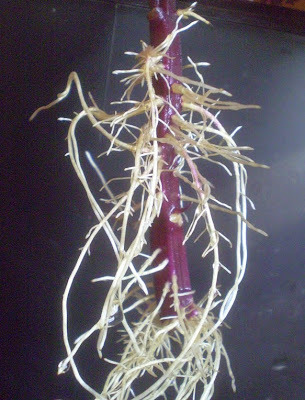 PROPAGATION: Solenostemon is one of the easiest plants to root from cuttings. The procedure is generally that you cut off the top four inches of a stem, remove the bottom couple pairs of leaves, stick the bottom in water, and wait for roots to begin to grow, which will typically happen within a couple weeks, then transplant to soil. Mr. Brown Thumb has recently posted about this as well, though I differ with him on a couple points.9 I've also planted cuttings directly into soil, which often ends in rot, unfortunately. Vermiculite is a much better medium for cuttings, because vermiculite is magic. You don't actually need the full four inches, though: an inch of stem with a couple leaves on it is enough. Rogers recommends cutting the leaves in half, or more, to reduce the amount of water loss; if you don't cut the leaves back, they're likely to fall off on their own while the cutting is rooting. 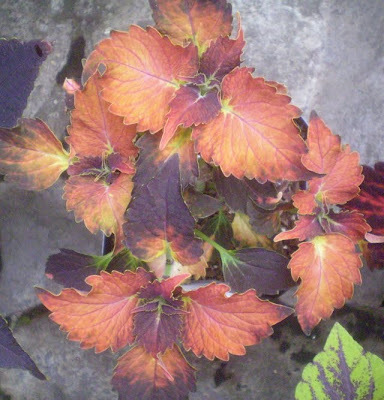 It's also fairly common to grow coleus from seeds, though if you collect your own seeds, the new plants are unlikely to look like the plants you collected the seeds from: patented varieties typically don't come true even if both parents are the same, and you have no assurance that both parents will be the same. Coleus from seed is, on the other hand, a great way to get around the prohibition on selling patented plants,10 so if you want a wide assortment of sellable plants, buy a dozen different patented varieties, plant them close together, collect the seeds when they flower, and plant those seeds: voila, hundreds of unpatented coleus to choose from and propagate to your heart's content. This is unfortunately kind of impractical for most of us, as you have to plan it ahead about a year in advance, and then have lots of room in which to raise and evaluate the seedlings, and then even more space to propagate the seedlings once you decide which ones are keepers. Most of what you'll get from random pollination won't be terribly interesting, I'm told. Still, this is another way that new varieties come about, and is an especially useful method if you're looking for a plant that will do well in a very specific environment. 'Tilt a Whirl.' This one gets really awesome with age, though I've only seen one older specimen, and for some reason failed to get a picture of it. 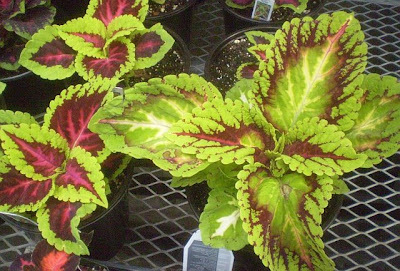 GROOMING: Coleus need to be pinched back from time to time, though the degree to which this is necessary varies somewhat among varieties: some plants self-branch pretty well on their own without a lot of encouragement, and others need to be pinched back constantly. Pinching is even more necessary in situations where plants are crowded, as in the case of group plantings, or when they're being displayed on tables in the garden center. Whether or not "pinching" involves actual pinching of anything is kind of up to you: I've snapped stems by bending them to the side, I've pinched off the tiny leaves at the growing tip, and I've cut plants with scissors. They all work. As day length shortens in the late summer and fall, plants will try very hard to flower: unless you're trying to get seeds, it's best to remove flower spikes as you see them. Different varieties vary considerably in their determination to flower: according to Rogers, the worst about this are the mixes grown from seeds ('Wizard Mix' and 'Rainbow Mix' are the ones I'm most familiar with, because we carried those at work), for the obvious reason that a slow-flowering plant is likely to select itself out of the mix, when the next year's seeds are being selected from the stock plants. Plants don't necessarily die after they've flowered, though they may; Rogers is uncharacteristically silent on the topic. Flowering does usually lead to a period of decline, and individual specimens don't appear to be especially long-lived, though I think this happens whether you remove the flowers or not. FEEDING: Pretty much what you'd expect: regular plant food at about half strength with every watering, seemed to be the usual recommendation I saw when poking around on-line. At one point during the writing of this profile, it looked like I was going to have to split off the PROPAGATION section into a Part II, because the law is not entirely clear about what you can do with a patented plant. We were once told at work, under circumstances I will leave to the reader's restless imagination, that any unathorized propagation of any patented plant is illegal, regardless of who you are and what you intend to do with it. However, I was hearing this second-hand, and may have misunderstood the context, and whatever the conversation actually was, I don't think this is true anyway. As best as I can determine -- and do keep in mind that I am not a lawyer -- you may propagate your own personal plant, for which you paid the going retail price or obtained through other legal means, for your own personal use. Whether this means that you're taking cuttings in the fall to overwinter and replant in the spring, or propagating one plant instead of buying two, or taking cuttings after cuttings until you have enough to rip up the sod in the back yard and turn it into a field of 'Splish Splash,' you can do that. The point where it becomes illegal is when you start propagating it to sell. 'Splish Splash.' Trying to overwinter this one also. So, like a temp, just because it's working for you doesn't mean it's yours exactly, not completely. It really works for, and belongs to, someone else, who is just letting you use it for a while, within certain agreed-upon limits. Although there's nothing in particular (aside from your own conscience) preventing you from propagating hundreds of patented coleus varieties and then selling them at the Farmer's Market, or in a yard sale, or whatever, it is in fact illegal and could result in prosecution, fines, obscenity-filled rants, or what have you, if the right person showed up at your yard sale. It is theoretically possible for an individual to pay royalties to the patent holder and then propagate your little heart out for a garage sale or whatever, but I have no idea who you would even contact to pay royalties to, nor do I have any idea how much money would be involved or if it could possibly ever be worth your time. But sure, if you were really dedicated to the idea of propagating patented coleus to sell, I'm sure there's a way to make that happen. It's just, you know, why would you bother? 'Saturn.' I will probably be buying one of these next spring; I bought one this year, but again, it kind of got neglected in all the confusion of the summer and wound up not getting enough light and looking terrible. But I know they're capable of looking amazing, because Rogers has some stunning pictures. 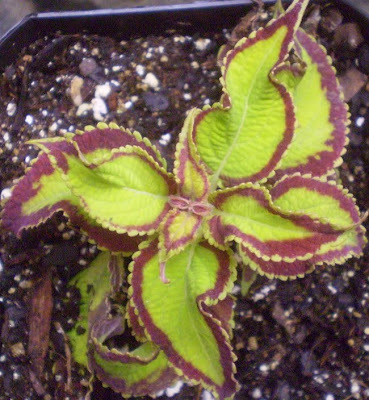 Meanwhile: Ray Rogers, author of the book mentioned previously, has founded a coleus society. There isn't a whole lot on the page just yet, but it's there. It's unclear how old the page is; I can't promise that it'll be worth keeping an eye on, but you never know. 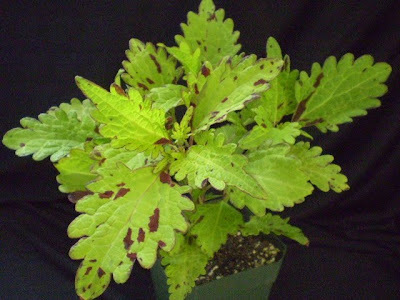 Rogers also tried starting a coleus blog, which is linked from the coleus society page. It contains some interesting information (some of which overlaps things in the book, and some which doesn't), as well as some nice pictures, but the last post there is over a year old. I do not know what this means, exactly. 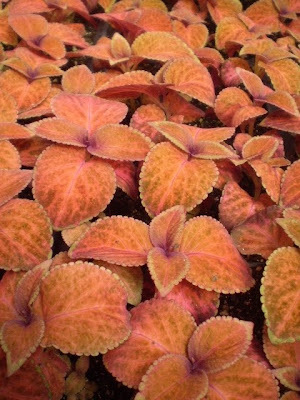 But it's worth checking out, if you haven't gotten enough coleus talk already. Photo credits: All my own, if you can believe it. 1 Solenostemon scutellarioides is still better known by its former (but wrong!) 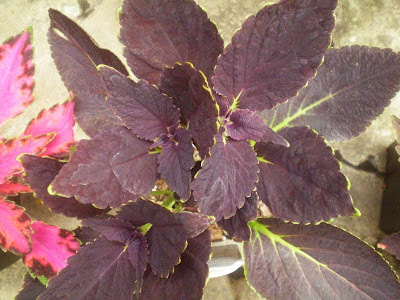 name, Coleus blumei, and usually called "coleus," even by people who know the name Solenostemon. Some websites and books also give "flame nettle" as a common name, but honestly I have never in my life heard someone call coleus flame nettle, ever, and suspect that this is something that the writers of horticulture books made up just to see how many people would play along, and bam said the lady, now all the books and websites include it. But I am onto you, writers of horticulture books! 2 Of course, whether or not coleus makes for good bonsai is somewhat dependent on your expectations for what makes good bonsai. They're not particularly long-lived (3-5 years), but they can be shaped into things that look remarkably like small trees. I have no idea whether they're easier or harder to take care of than other bonsai subjects. 3 Most of the fifteen are pictured in this post, though I don't have pictures for a couple of them (I'm missing 'Kong Red,' 'Electric Lime,' and maybe one or two others). 5 By "owe their entire existence to human intervention" I mean that the plants didn't spontaneously mutate or sport. Some person, at some time, had to deliberately cross-pollinate, irradiate, genetically engineer, or repeatedly select, plants which would otherwise have been perfectly happy to continue to do what they had been doing already. Among the more commonly encountered man-made indoor plants: Cordyline glauca; Begonia rex-cultorum (and most other Begonia cvv., too, for that matter); Anthurium "hookeri;" Chlorophytum x 'Fire Flash;' most cultivars of Aglaonema, Dieffenbachia, Philodendron, Streptocarpus, and Saintpaulia; most cultivated orchids; and Fatshedera lizei. I cannot stress enough that this is not even close to an exhaustive list. The first person to say "playing God!" will get smacked in the face. 6 It's fairly difficult to explain transposons, but they're more or less strings of DNA that are prone to moving around to new spots in the genome, or getting themselves copied and stuck somewhere new in the genome. When reinserted, the transposon may land in a meaningless or unimportant stretch of text, where it doesn't really affect anything important, or it may land in the middle of a gene that codes for something important, which will almost always screw up the protein made by that gene. Color variation within a single plant, as for example the kernels in "Indian corn," may occur when transposons are jumping in and out of pigment-producing genes, disrupting their function some of the time but not all the time. It's fairly complicated stuff, and I don't fully understand it myself, but Nobel Prizes get awarded for discovering this sort of thing, so it's clearly important. Barbara McClintock was awarded the 1983 Nobel Prize in Medicine for the discovery or transposons (in Indian corn) in 1948. At the time, she was only the third woman to win the Nobel in Medicine, which is kind of cool unto itself. 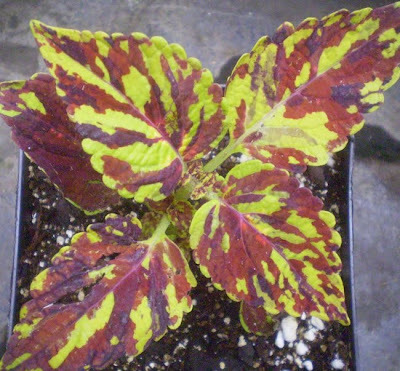 I don't know whether transposons are implicated in the overall tendency of coleus to sport, though they are thought to be involved in certain types of leaf colorations, especially speckled and dotted patterns, and coleus have those in abundance. 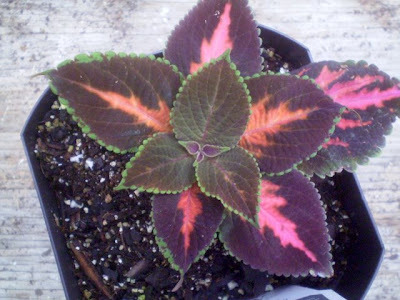 I did find one paper which theorized that the coleus variety 'Green and Purple' was the work of transposons (ref. ), but then I couldn't find a picture of any variety called 'Green and Purple,' not even in Rogers' book, so that was sort of unhelpful. 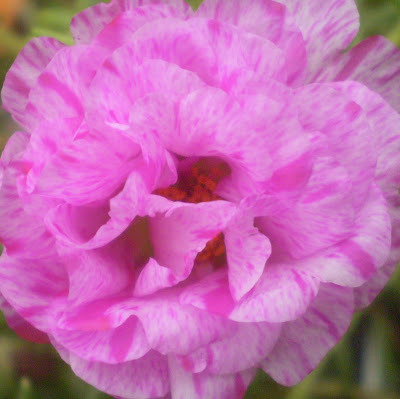 We may be able to get a feel for the kinds of patterns transposons cause by looking at other situations in which they influence color, for example certain types of Saintpaulia flowers (some of the speckled "fantasy" types), Portulaca flowers, and certain kinds of mixed-color roses. A miniature rose (Rosa sp.) 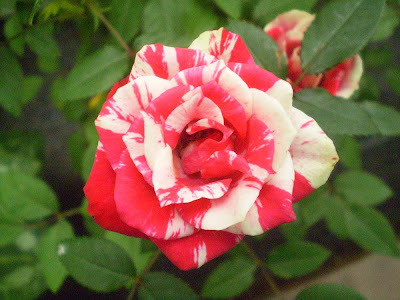 with the kind of color pattern typical of transposon-caused variegation. A Portulaca grandiflora 'Sundial Mix' that is almost certainly variegated because of transposons. 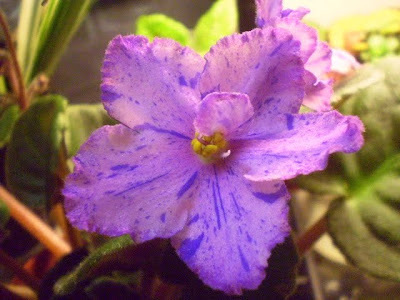 Saintpaulia ionantha 'Mellow Magic' flower. Chimeric Saintpaulia flowers also exist, but are more likely to be striped, or outlined in white (the 'Geneva' type of variegation). Dotted flowers like this are, according to the internet, likely to be from transposons. The closest match I have personal experience with is 'Dappled Apple,' but 'Splish Splash' and 'Quarterback,' though they have coarser patterns, with larger color blotches, could also be transposon-derived. Maybe. The coleus situation is very complicated, because in addition to regular old recessive-and-dominant genetics like grandma used to make, and transposons, some kinds of variegation in coleus are thought to be chimeric (one kind of chimerism was discussed in the second half of the Sansevieria trifasciata profile), and there are hints here and there that viral infection may also play a role. (Those of you who have read Michael Pollan's book The Botany of Desire will remember that viral infection also changes the colors of tulips.) So I can't really definitively say anything about any variety, unfortunately, nor can I answer the original question about why it's such a variable species, but there are bits and pieces of the answer scattered around in here. 7 Other highly variable, sport-prone houseplants include Syngonium podophyllum and Hedera helix; my choice of "person" for the Syngonium profile ("dilettante") was based on this tendency. 8 Transpiration: evaporation of water from plants, particularly the parts of plants which are above ground. Transpiration is partially a side effect of collecting carbon dioxide: the openings in the leaves that bring CO2 in also let water vapor out. This continual loss of water from the top of the plant brings water up from the roots, which drags along with it nutrients needed by the top of the plant. It's also useful in temperature-regulation: plants that are transpiring a lot stay cooler in the same way that evaporation of sweat cools the human body. 9 Coleus, like Plectranthus verticillatus, Tradescantia zebrina and T. pallida, and quite a few other types of plants, can and does form roots all up and down the stem, not just at the nodes, so it really doesn't matter so much whether you cut the stem just above a node, just below, or right in between -- it'll still root. A cutting of 'Peter Wonder' that I really ought to pot up already, since it's clearly ready. 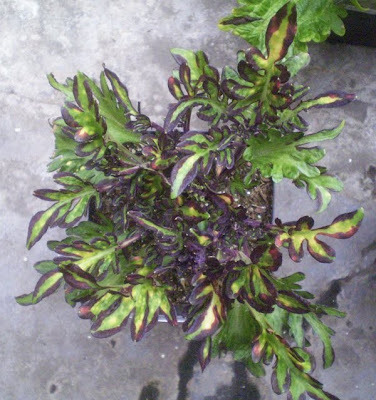 My 'Peter Wonder' plant didn't look so great, because I had it in too sunny of a spot, and it turns stupid colors in bright light. We'll try again next year if any of the cuttings survive. I also think that coleus roots itself so easily that using rooting powder is a waste of money. Mr. Brown Thumb was providing general advice on taking cuttings in that post, and just happened to be using coleus as the example in the pictures -- a lot of plants really won't root anywhere other than the nodes, and really will benefit from the use of rooting hormone powder, though since I don't use rooting hormone personally, I'm not sure what plants those might be. 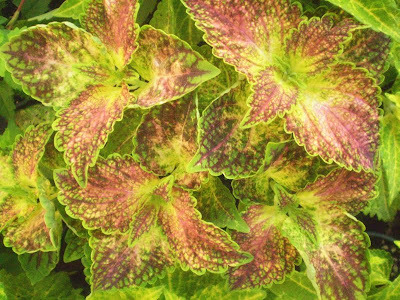 Nothing bad will happen if you follow his instructions, but with coleus you'd be making more work for yourself. 10 Though I would bet a substantial amount of money that there are already a large number of people hard at work at ruining this method of coleus propagation for everyone forever as well. But...but.... we're playing god with these poor plants! Fabulous pictures and great information! I may actually attempt some container-coleus next year. This was very encouraging. 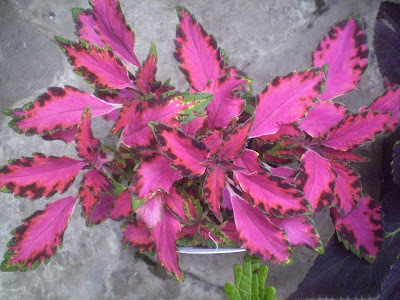 I've had one coleus that looked awesome for a long time (a rescue from work), but since then, not much luck. Still gonna try, though. 'Fishnet Stockings' and 'Tilt a Whirl' are pretty awesome. 'Saturn' is pretty, too, but not quite awesome. I want! I've rooted coleus in soil just as easily as in water. Didn't drop leaves, either - the only leaf-dropping that happened was when I potted up the water-rooted cuttings. I'm not sure if it amuses or depresses me that the 'Rainbow Mix' is exactly what we have at work. It's kinda sad there are the same varieties all over the world. Although that's not really true, since I haven't seen any of your awesome varieties here yet. I loved to say "Solenostemon scutellarioides" really fast - gotta love the reactions of, "How can you remember this?!" Only now, the newest edition of the "Zander" Dictionary of Plant Names (apparently, the ultimate authority in nomenclature at least in my little country, and presumably in German-speaking Europe) calls it Plectranthus scutellarioides. Rogers says 'Fishnet Stockings' tends not to maintain its coloration consistently over the whole season, if that matters to you. Also check out this picture of 'Saturn,' which is more typical coloration for a full-grown plant than the picture I posted. 'Rainbow Mix' is seriously old: Rogers says he remembers it being sold in the 1950s. 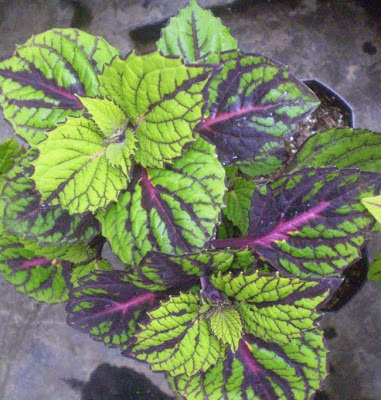 I won't argue that Plectranthus isn't the right name, but I would prefer it to be Solenostemon, having just gotten myself to the point where I can type "Solenostemon scutellarioides" quickly and fluidly. Also, although I can believe they're related to Plectranthus, they don't look enough like Plectranthus to me. I mean, not that that matters, botanically, but it's always easier for me to accept a new ID for something if it actually looks like it belongs there. Wow. Again, Wow. Your footnotes have pics. Dating myself, but when I was learning this stuff in school it was "Coleus Blumei" (and you could find both species of Swedish Ivy.) Google's 1st search results page for Solenostemon scutellarioides pronunciation shows 5 different ones (one with a silent "R"!) Sigh. I tried a packet of mixed seed last summer. While the picture looked diverse (don't remember what it was called, my bad), the result was like a disappointing mix of Kong (not so)Rose crossed with Merlot w/ much more green, like a commercial property bed filler. Leaves were really large though. I'm with Ivynettle: Fishnet Stocking (who thinks up these names?) and Tilt-a-Whirl are awesome in a not-over-it-in-five kinda way. Thanks for another great post. 'Kingswood Torch' and 'Merlot' are probably my favourites out of these pictures. Fantasy markings (solid stripes) are chimeric. Speckled flowers such as I assume the one you posted but for sure Saintpaulia 'Rebel's Splatter Kake' can be reproduced through leaf cuttings - Hostas such as Hosta 'Revolution' I guess are also the result of transposons as well. Wizard Sunset Sun is a true variety, slightly separate from Wizard Sunset. Pan American Seed is the breeder, now owned by Ball Horticultural (who I used to work for). When I spoke to the breeders (because I was just as confused as to why there were different names, too), they said the 'Wizard Sunset Sun' cultivar was better for sunny aspects than the regular old 'Wizard Sunset'. It made recording at work a nightmare, let me tell you. They had a few more (3 maybe) 'Sun' colors, but my guess is most nursery customers could never tell the difference so they bought by color and not cultivar. Oh, and on Ball's website, they show two different pictures of 'Wizard Sunset', one looking decidedly more red than the other. Thanks for writing about this houseplant, also a garden workhorse. Don't really enjoy Mr. Ray's book, I read it, not impress with the detailing, I was hoping more details since there is no :coleus society, or solenostemon society to do it. There is nothing peculiar in the book, e that I cannot found in the internet. Mind you...your blog post is more informative, good sense of humor is A+, more fascinating than his book. I will track down the other one you mentioned. I did not have them this summer outdoors, but started overwintering indoors ( friends donation of cuttings), which Black Dragon captures my imagination. I bought many seeds from different seed suppliers, hoping to find any variety that can do spins and back flips for me. Thanks for the article. Ulrich, looks like Quarterback with yellow edgings. As a house plant, I agree with your difficulty assessment. But the way I use this plant makes it a 2 to me. It would get a 1 if it was not such a thirsty thing. One can take 4 pieces of the same plant and put them in different sun exposures and visually there will be 4 different plants. So different you have a tiny moment of hesitation when you tell people they are pieces of the same single plant. They are one of the foliage backbones of my yard every year. Even if something sunburns, new leaves will be fine, and I haven't had any that wouldn't thrive in full sun in southern AL if I can water them enough. Those in full sun need a drink almost every morning, so suitable not for everyone's schedule if it rarely rains at your house. A really fun, surprising, and rewarding plant to experiment with cuttings in different places. I gave up trying to keep potted plants over winter. The easiest thing to do is put cuttings in water, no submerged foliage. I like more of an 8" cutting, and usually just let the size of the branches determine the size of the cuttings. I don't leave much outside to freeze to death when I can save it. Don't let them go dry, lots of sun preferably on a windowsill, any but north. Put back in yard and porch pots when danger of frost has passed. Leaves your budget to add new varieties to your collection, in the spring you have bigger plants than those little 6-packs at the stores, requires a very small amount of time and space. Been doing this for over a decade. As far as I can tell, OH is a hotbed of Coleus breeding activity from Baker's Acres (in Alexandria) and Glasshouse Works (in Stewart.) I've met the owners of both places and am not surprised by the wild and funny names. They come from fascinating people! I am obsessed with putting my houseplants outside, (never did it before) and read you suffered with low night temperatures and hauling plants in and out, as I have been. I want to put them out because I am tired of them inside. Some better grow and look interesting or else, and etc. So as I read you too cannot just take them out and leave them, I wondered if you lived somewhere in western Washington as I do. My nosyness had me stalking you on the world wide web. I stumbled onto many many sites giving some of your lifes experiences. I no longer wish to know where you live. You are far too big a star or treasure for such invasions. And I apologize. I do want to say, I have been so lucky to find your plant blog, as I have so loved reading it and wondering about the crazy mind that writes from a place of truth and a desire to surprise and shock, and rebel. In reading of some of your life experiences, how I have come to love and admire you. I am sorry I was wanting to know more than is my right, it was truly only about plants and growing zones, but it was just a bit creepy and again I am so sorry. Instead I am going to run out and buy a few new books you have written, and what a treat it is going to be. Thank you for the fun you bestow on us. I hope others run out and do the same. Instead I am going to run out and buy a few new books you have written, and what a treat it is going to be. I may have some bad news for you. . . . I know it's been a while since you posted this, but many authors of scientific papers are happy enough to send you a free copy of a paper if you contact them. Most have the legal right to do so. I only recently discovered this blog while reading up on schlumbergeras. I'm currently going through your posts from the beginning. Very fun and I look forward to the 9 more years of posts ahead of me! You've mentioned trade(and selling? ), do you do so through email or another site? Sorry if it was posted already and I missed it. Good to know, about the papers. I have both sold and traded plants in the past, via e-mail, though I didn't do it this year and it's too late (cold) to start. If you're interested and in the U.S., your best bet is to e-mail me in April and see how I feel about sending some plants out in May or June. I am definitely interested and am in the U.S. so I'll check back with you later about buying some plants or cuttings (I'm in love with your schlumbergeras).